The crisis gripping Ukraine has plunged transatlantic relations to their lowest point since the Cold War and threatens to send Ukraine into an armed conflict with potentially dire consequences for the country and the wider region. Moscow's alleged meddling in eastern Ukraine and its earlier annexation of Crimea spurred worldwide rebukes and much international commentary regarding the growing East-West divide. But one aspect that we have heard less about is the corporate struggle for Ukraine's oil and natural gas. By some accounts, it is this struggle that is as much to blame for the current crisis as any geopolitical tug-of-war between East and West. Ukraine has Europe's third-largest shale gas reserves at 42 trillion cubic feet, according to the U.S. Energy Information Administration. While for years U.S. oil companies have been pressing for shale gas development in countries such as Britain, Poland, France and Bulgaria only to be rebuffed by significant opposition from citizens and local legislators concerned about the environmental impacts of shale gas extraction -- including earthquakes and groundwater contamination caused by hydraulic fracturing or "fracking" -- there has been considerably less opposition in Ukraine, a country that has been embroiled in numerous gas disputes with the Russian Federation in recent years. Russia's state-owned Gazprom, controlling nearly one-fifth of the world's gas reserves, supplies more than half of Ukraine's gas annually, and about 30 percent of Europe's. It has often used this as political and economic leverage over Kiev and Brussels, cutting gas supplies repeatedly over the past decade (in the winters of 2005-2006, 2007-2008, and again in 2008-2009), leading to energy shortages not only in Ukraine, but Western European countries as well. This leverage, however, came under challenge in 2013 as Ukraine took steps towards breaking its dependence on Russian gas. On Nov. 5, 2013 (just a few weeks before the Maidan demonstrations began in Kiev), Chevron signed a 50-year agreement with the Ukrainian government to develop oil and gas in western Ukraine. According to the New York Times, "The government said that Chevron would spend $350 million on the exploratory phase of the project and that the total investment could reach $10 billion." In announcing the deal, President Viktor Yanukovych said that it "will let Ukraine satisfy its gas needs completely and, under the optimistic scenario, export energy resources by 2020." Reuters characterized the deal as "another step in a drive for more energy independence from Russia." The United States offered its diplomatic support, with Geoffrey Pyatt, the U.S. ambassador to Ukraine, saying, "I'm very determined to cooperate with the Ukrainian government in strengthening Ukraine's energy independence." 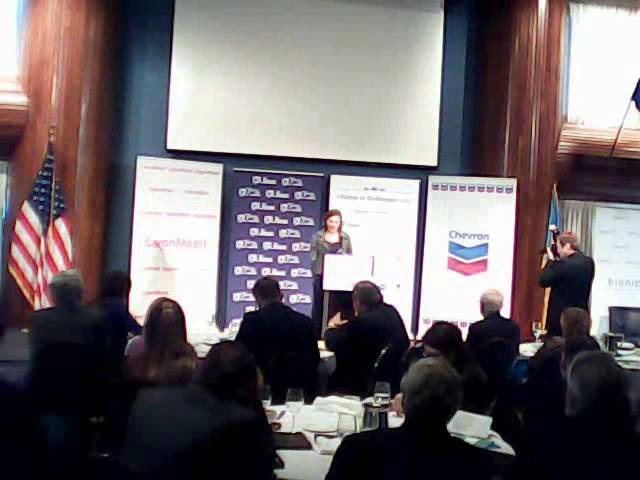 U.S. Assistant Secretary of State for Europe Victoria Nuland spoke at an international business conference sponsored by Chevron on Dec. 13, 2013, after just returning from Kiev where she handed out cookies and sandwiches to demonstrators on the Maidan. In her speech, she urged Ukraine to sign a new deal with the IMF which would "send a positive signal to private markets and would increase foreign direct investment that is so urgently needed in Ukraine." This is important for putting Ukraine "on the path to strengthening the sort of stable and predictable business environment that investors require," she said. Although stability and predictability are not exactly the words that people would associate with Ukraine these days, Western energy companies have continued to maneuver for corporate rights over Ukraine's shale gas deposits. Last fall, officials were in negotiations with an ExxonMobil-led consortium to explore for hydrocarbons off Ukraine's western Black Sea coast. On Nov. 27, the Ukrainian government signed another production-sharing agreement with a consortium of investors led by Italian energy company Eni to develop unconventional hydrocarbons in the Black Sea. "We have attracted investors which will within five to seven years maximum double Ukraine's domestic gas production," Yanukovych said following the agreement. 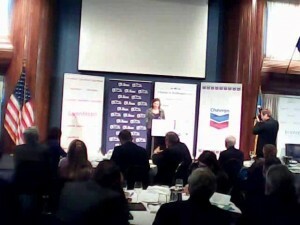 At the time of Yanukovych's ouster in February, Chevron and the Ukrainian government had been negotiating an operating agreement for the shale development effort in western Ukraine, and Chevron spokesman Cameron Van Ast said that the negotiations would go forward despite Yanukovych fleeing the country. "We are continuing to finalize our joint operating agreement and the government continues to be supportive," Van Ast said. Royal Dutch Shell is also engaged in the country, having signed an agreement last year with the government of Yanukovych to explore a shale formation in eastern Ukraine. When it comes to Crimea, numerous oil companies including Chevron, Shell, ExxonMobil, Repsol and even Petrochina have shown interest in developing its offshore energy assets. Believing that Crimea's onshore and offshore fields will live up to expectations, these companies have greatly expanded their exploration of the Black Sea off the Crimean peninsula. Some analysts believe that one of Vladimir Putin's motivations for annexing Crimea was to ensure that Gazprom will control Crimean offshore energy assets -- in addition to ensuring the continued use of Crimea as host to Russia's Black Sea Feet.